The Bushnell Sportview 20-60x60 is a high-performance variable-power spotting scope that allows you to see and track targets from extreme distances. Its wide range of power and variable zoom eyepiece allow quick, easy adjustments and observation at almost any range. Each lens surface comes with a multi-layer anti-reflective coating that maximizes light transmission to provide a clear, bright, high-resolution image. Its rugged tube is built to resist impacts for secure outdoor use, and it has its own compact tripod for comfortable hands-free use. 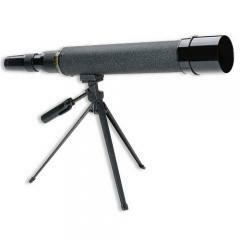 The scope also features a durable hardshell carrying case for portability and protection.